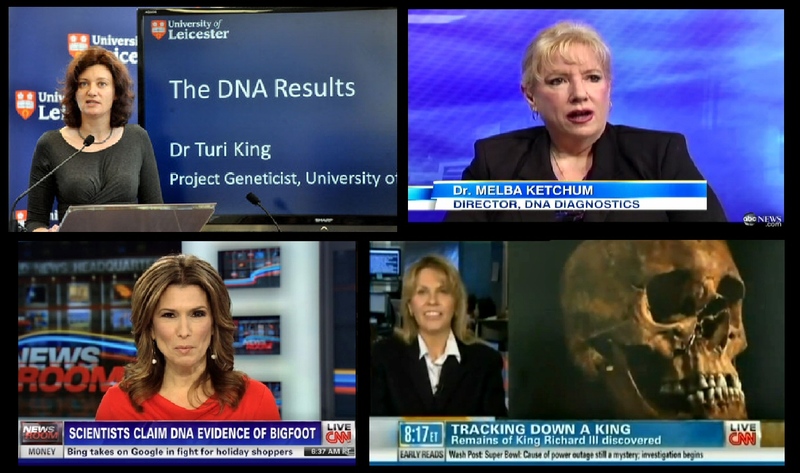 Last month saw not one but two major news stories revolving around the subject of DNA analysis. In America, there was the long-awaited publication of the Bigfoot DNA results, first announced in a press release in November last year. In Britain, there was the just as eagerly anticipated announcement that the remains unearthed in Leicester last September are indeed those of King Richard III, who was killed at the Battle of Bosworth in 1485. At first sight, the latter might appear to fall squarely in the domain of mainstream academia, but this isn’t the case at all. The discovery of Richard III’s remains was as much a product of “Outsider Science” as the Bigfoot DNA study. The search was funded and motivated by amateur enthusiasts who (like the Bigfoot hunters) set out with an emotionally-charged agenda to prove a particular theory – an approach that is, of course, anathema to professional scientists. And the way the Richard III hunters went about their quest was unorthodox to say the least, as was the way they announced their results to the public. Yet in spite of all of this, no-one seriously disputes that they found exactly what they claim to have found. This is in stark contrast to the Bigfoot DNA study, which ever since the results were announced has been the target of intense criticism from all sides. Sometimes Outsider Science works, more often it doesn’t. I thought it might be instructive to compare the two cases in a bit more detail. Like (I suspect) many other non-Americans, I’m not particularly interested in Bigfoot, and I’m constantly surprised at how passionate some people can become when discussing the subject. It’s a bit like ufology – not just an emotional battlefield between believers and skeptics, but between believers in one theory and believers in a rival theory. 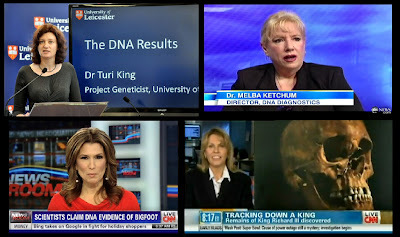 In fact, the most vitriolic criticism of Melba Ketchum’s DNA study has come not from mainstream scientists (who have generally ignored it) but from within the Bigfoot community. Much of the vitriol has focused on the way the results were made public before they had appeared in a peer-reviewed journal, which is held up as “not the way science works” (I’m not convinced this is true – see this Wikipedia article for a counterexample). When the full results were finally published last month, the journal in question turned out to be one that no-one had heard of, leading to allegations of vanity publishing. The reason Dr Ketchum’s paper wasn’t published in a more respectable journal is, simply, that all the respectable journals turned it down. The paranoid conspiracy explanation for this would be that the scientific community is out to suppress anything done by independently-funded researchers working outside mainstream academia, and/or anything suggesting that there might be a living hominin species other than homo sapiens. But I don’t believe that. If Dr Ketchum’s samples had turned out to have mitochondrial DNA identical to a modern human (which they did), and nuclear DNA that was non-human, but closer to human than a chimpanzee or bonobo, I’m sure the mainstream journals would have fallen over themselves to get it into print. But to say “the Sasquatch genomes were novel and fell well outside of known ancient hominin as well as ape sequences” suggests that what we have here is a new kind of hybrid outside the accepted laws of zoology and genetics. It’s easier to assume that the nuDNA (unlike the mtDNA) was too badly degraded to allow a proper analysis... and I bet that’s what all those peer reviewers who turned the paper down assumed. If the Bigfoot DNA study has a flaw, it will be found in the science and not (as a lot of the criticism has dwelt on) the way the results were announced to the world. Ten days before the Ketchum paper was published, the results of the Richard III dig were announced... not in a peer-reviewed journal, but in a morning press conference followed by a documentary on Channel 4 later the same day. On the face of it, that’s not a particularly professional way to go about things – an impression that was borne out by the documentary itself, which showed that at least some of the researchers were amateur enthusiasts motivated by a passion for their subject rather than professional detachment. That’s not a bad thing, of course (“amateur” comes from the French word for “love”, not “incompetence”), but it’s certainly unorthodox. Ironically, most of what I know about orthodox archaeology comes from another Channel 4 series, Time Team. They often make the point that real archaeology is about ordinary, low-status individuals – the sort of people you can’t learn about from the history books. As a general rule, archaeologists aren’t very interested in the world of Kings and Queens. This was strikingly expressed in a recent episode when it was said that, to a real archaeologist, finding a low-value copper coin is far more exciting than finding a high-value gold coin. Or to put it another way, archaeologists hate treasure-hunters... and looking for a dead King of England is arguably the ultimate in treasure-hunting! The Richard III dig set out to do something that was unthinkable to most serious archaeologists. There’s nothing wrong in excavating the site of a mediaeval priory... unless the sole purpose is a “treasure hunt” for one particular tomb. And that was unashamedly the case here. As soon as the body was found, the exercise switched from an archaeological dig to a forensic exhumation. The identification of the skeleton as that of Richard III was pretty strong even without DNA analysis, based on its age, gender, archaeological context, distinctive pathology (spinal deformity and battlefield wounds) and radiocarbon dating. In fact, the DNA analysis wasn’t complete at the time the announcement was made, having been limited to a comparison of the mtDNA with two living maternal descendants. Dr Turi King, the geneticist who carried out the study, was quoted in New Scientist as saying “As a scientist I would have preferred to finish the analysis, but I know the answer isn't going to change”. I’m sure she’s right, but I have the feeling that if Melba Ketchum had said the same thing she wouldn’t have been allowed to get away with it! The discovery of Richard III’s burial site is one of the great triumphs of Outsider Science. It proves that when it’s done properly (and given a fair amount of luck) it really can come up with the goods. Sadly, successes like this are quickly appropriated by the mainstream, and people forget they were initiated by “outsiders” who were originally viewed as crackpots. In fact, they still would be viewed as crackpots, if the trench had been dug just half a metre from where it was – in which case the body would never have been found! That was the fate of another (superficially very similar) enterprise last month, when a group of amateur enthusiasts tried and failed to find a cache of WW2 aircraft they believed had been buried in Burma (Search for buried Spitfires in Burma called off).